There’s no need to go over lengths about Jean-Luc Godard’s accomplishments. The famed French filmmaker rivals Orson Welles as the most pivotal figure in the development of modern day cinema and his status as one of history’s greatest directors is unquestionable. However, Godard, particularly in recent years, also represents the stereotype of the European film elitist snob, one who pompously sneers at pop-culture outside his reach and derides anything that in his eyes is unworthy of artistic value. Goodbye to Language unfortunately epitomizes the latter trait, too often hammering down Godard’s “life is cinema, cinema is life” idealism with Euro art-movie tendencies. At times it almost feels like a parody of Godard films with a usual mix of ambiguity and startling jump cuts to an overwhelming point. Like many contemporary Godard pictures, Goodbye to Language is a completely experimental avant-garde film, with 3-D cinematography an added bonus. And like many Godard movies beforehand, Goodbye to Language crosses pop-culture with politics and social order, mixing Frankenstein and Metropolis with the French Revolution and the Third Reich, with various opaque voiceovers stringing these bubbles together. Utilizing a great dosage of surrealism, Goodbye to Language is a difficult film to digest. 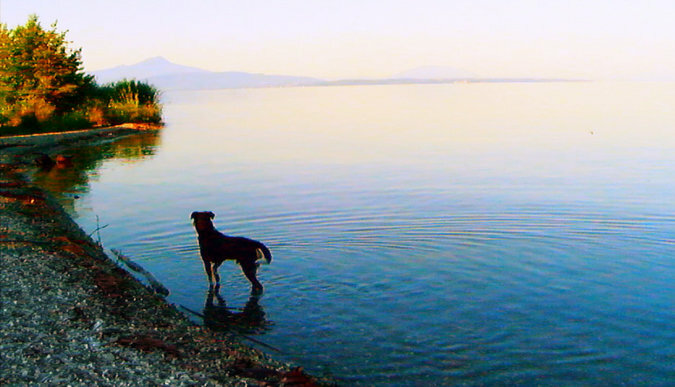 Even as a fan of experimental cinema, I found the movie too perplexing to follow to the extent that I didn’t realize the picture followed a couple consistently bickering at a lake-house (Goodbye to Language’s other star is Roxy, Godard’s dog who appears sporadically throughout the feature). Godard makes Goodbye to Language arduous to follow and even harder to understand, yet his intention stood clearly to me on the media’s role in shaping our communication and understanding of the world, utilizing a sequence of minute metaphors to emphasize this point. Yet despite all of Goodbye to Language’s technical accomplishments, the movie’s message is nothing new. Just about every Jean-Luc Godard film has illustrated the balance between media and reality before and Goodbye to Language feels like a glib rehash of a superior work such as Weekend. I admired Godard’s visual eye, which made clever use of its cinematography that made me regret watching Goodbye to Language on a laptop screen instead on a 3-D projection yet I still remain frustrated with his stubbornness. For a director well into his 80s to embrace new technology, it appears that Godard seems unwilling to make a truly new picture, one that breaks free from his singular “cinema is everything” idealism for something more unique about the world around us. Even better, I would prefer if Godard moved back into the narrative form, where he utilized experimental features in order to propel a story. Perhaps I’m being too harsh on Goodbye to Language; it’s a film well worth watching to absorb its vast array of thematic material. But for all it’s worth, Goodbye to Language is a messy picture that too often appears to be spiraling into the oblivion. « What Do You Think of Marc Forster Directing Stanley Kubrick’s Civil War Script? I couldn’t agree more. This was a messy film and it feels like Goddard has lost his touch. Thanks and I’m glad I’m not the only one who sees this film this way. I just wish Godard would return to the narrative form. Ugh. I hated Film Socialism so much. I get that Goddard is an artist and I’m pretty open to artistic films but FS was obnoxious. I guess maybe it’s over my head. Will definitely skip this one but thanks for the review. I haven’t seen Film Socialism so I can’t comment on that. I love Godard’s work, but I found this to be too repetitive of his past movies. Even though experimental cinema is one of my favorite genres, I just couldn’t get into Goodbye to Language. It’s brutal. Even Roger Ebert called Godard out on it. I looks messy but still very intriguing. I have found Godard’s later work to be very hit or miss. I think he embraced hi “artist” reputation a bit too much. Still, when I see his name I always want to know more about the film. I definitely agree with you on Godard being a high artist; he really has a “holier than thou” attitude when it comes to filmmaking. I’d recommend checking Goodbye to Language out for its visual wonders but Breathless this movie is not. Godard’s early work was better IMO. I think his experimentation and distinct purpose behind his style showed itself in some incredible filmmaking. These days…I don’t know. But I will definitely check out Language if it ever gets here! One of the weirdest film I’ve seen… Still brings some thought provoking imagery and concepts! This never played here, and I still haven’t seen it. Yet I saw it on Sight and Sounds best films of the year list. I’m not sure if I want to see this to be honest, I’m not even familiar with his early work at all! I missed it in its initial run back in 2014 and ended up seeing it on iTunes via my laptop (something which I rarely do). I really wanted to like Goodbye to Language but it felt like a parody of Godard to me. Watch his early stuff like Breathless and Vivre Sa Vie, those are masterpieces that don’t get so overly pretentious. I haven’t seen Alphaville yet so I can’t comment on that one. Breathless though is superb, watch that immediately. I think I will. Hopefully I’ll get enough out of it to write about it. I’m kinda getting into a headset of being less like a ‘critic’… just writing about films instead of looking at it, ticking off boxes… I’ve stopped giving scores to films cos it seems so basic to reduce a film to a simple score… if you get my drift.